When your client happens to be the largest road maintenance, hand-laying, patching, reinstating contractor in East Anglia and is in need of a brand new website fast, you pull out the stops and get on with it! 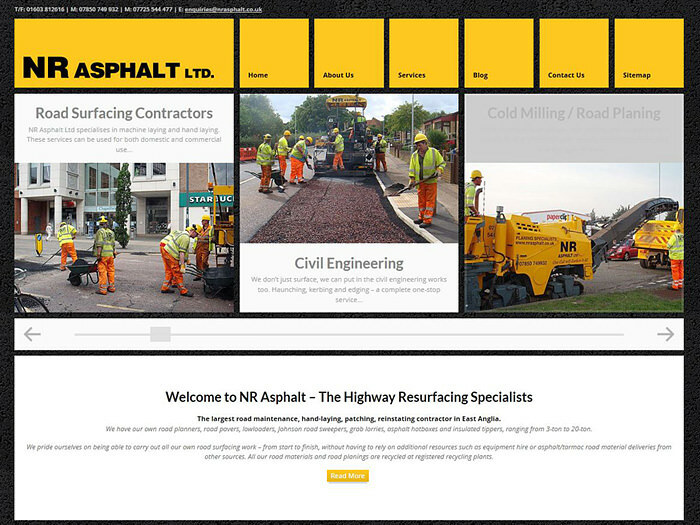 This new website design for NR Asphalt was developed and published in just two weeks, replacing an earlier one that we did for them a few years ago. The new website embraces up-to-date technology, responding to the device that is accessing it and incorporating the power of social media. It also allows the client easy access to a simple-to-use online editing control panel. We are proud to add this new website to our growing portfolio, which you can view [here].